Choosing Nikki Haley as his Ambassador to the United Nations may have been President Trump’s very best Cabinet decision. Since day one she has been an absolute rockstar at the United Nations and she has delivered jarring attacks on our enemies, stirring speeches in support of our goals, and cutting criticism of the hypocrites who attack the USA and Israel while coddling terrorist sympathizers and human-rights crushing strongmen. 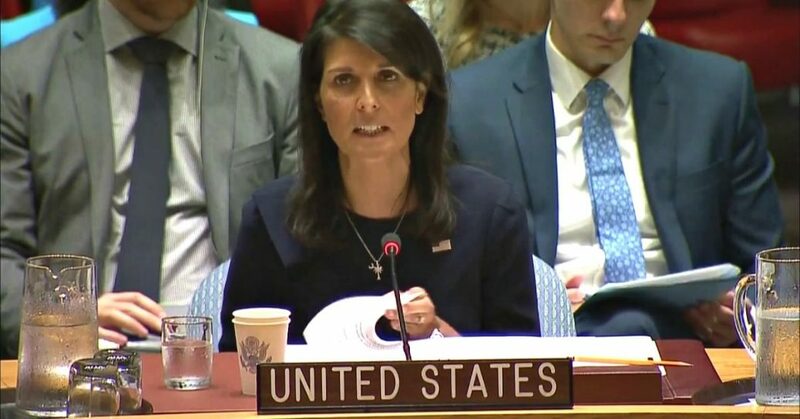 She was recently in perfect form once again, when she hammered our UN partners for being “obsessed” with condemning Israel but refusing to say anything negative about Hezbollah. The United States shares everyone’s concern about the heightened tensions in Jerusalem. All parties should work to reduce these tensions, and we offer whatever assistance we can in helping to do this. At the holy sites, it is vital that both access and security be ensured. In keeping with Nickolay’s recommendation, I am going to refrain from further comment on this sensitive issue in the hope that wisdom will prevail over emotions. This is our monthly gathering to discuss the Middle East. The complicated and seemingly unending conflict there is frustrating to many Americans. It’s frustrating to me. But truth be told, the Security Council often makes the Middle East more complicated than it actually is. It obsesses over Israel. And it refuses to acknowledge one of the chief sources of conflict and killing in the Middle East – that is, Iran and its partner militia, Lebanese Hizballah. Hizballah is a terrorist organization. In its own words, it is dedicated to the destruction of Israel. It has the blood of hundreds of Americans and thousands of others on its hands. Together with its Iranian patron, Hizballah seeks to cause destruction throughout the Middle East. Some see “two wings” to Hizballah – a terrorist wing, and a political and social wing. This is a convenient excuse for Hizballah, but it is dangerous fiction. Just because a terrorist group also promotes political candidates for office doesn’t make it any less a terrorist group. For a glimpse of Hizballah’s true nature, look no further than its work on behalf of the Syrian dictator. From its base in Lebanon, Hizballah sends its men into Syria. There, they have been responsible for some of the bloodiest campaigns of a very bloody war. They are returning to Lebanon battle-hardened, and their presence in Syria keeps open their supply route of sophisticated weapons from Iran. Simply put, Hizballah has grown stronger. It is preparing its men and its arsenal for a future war. None of this is secret. The leader of Hizballah boasts about the destruction that his group is capable of. He talks openly about the support Iran provides. Hizballah even takes journalists on tours of its military operations on the border Lebanon shares with Israel – operations that are in defiance of this Council. It is no secret where the United Nations stands either. It has passed multiple resolutions calling on Hizballah to disarm. It has called on the Lebanese state to exercise control over its territory. But neither of these things has happened. The trend is very much in the opposite direction. Hizballah openly defies these resolutions and impedes the Lebanese government’s ability to exercise full control over its territory. For too long, the Security Council has chosen to pretend that the status quo is acceptable for the people of Lebanon. It is not. Hizballah’s illegal weapons build-up is putting the people of Lebanon in great danger. Remarkably, this Council cannot even bring itself to use the word “Hizballah” in recent resolutions or statements on Lebanon. Many here are happy to name Israel, time after time, but Hizballah is somehow off limits. It’s absurd. Worse than that, it’s dangerous. The least the American people expect from this Council is to acknowledge the obvious threats that are right in front of us. How can I explain to them that there is a terrorist organization preparing its men and its arsenal for war, but the United Nations refuses to even say their name? This must change. We must show Hizballah that they cannot get away with its illegal weapons. The United Nations peacekeeping force in Lebanon has an important role to play. The United States supports UNIFIL. But there is much more that UNIFIL should do to help prevent another conflict. It can begin by acknowledging what is happening right under its nose. There are reports of UNIFIL not fully investigating alleged violations. Sometimes it fails to report what its investigators have found. If UNIFIL can’t acknowledge illegal weapons that Hizballah parades in front of the media, one wonders what else it’s missing. We will have more to say about UNIFIL when its mandate is up for renewal next month. The American people sympathize with the challenges facing the Lebanese people. We will continue to support them as they combat ISIS and host over a million Syrian refugees. We understand that the issues in the Middle East are complex. But we also understand right and wrong, and we expect our leaders to know the difference as well. Hizballah is a destructive terrorist force. It is a major obstacle to peace. And the dangers it poses are getting larger, not smaller. Simply acknowledging this – and saying it out loud – would be a significant step forward. But we must do more than that. We must begin to get serious about enforcing our own resolutions that have been routinely violated by Iran and Hizballah.